1. Last Saturday we tried to go to a late breakfast/early lunch at DeLuca's in Robinson, but there was a wait and we were really, really hungry. So we went to Burgatory where, since they had been open only about a half an hour, there was no wait. I custom ordered my usual crab burger on brioche with gouda & bacon BUT we discovered they now offer bacon jam as a topping! We haven't been to Burgatory in a while, maybe since last August or September, so this was a new topping to us. Of course I had to try it (on the side). It's delicious! SP also convinced me to try an appetizer even though it was lunch time and even though the burgers are so big and filling that my belly doesn't really have room for an appetizer: Just Fork It, pictured above. 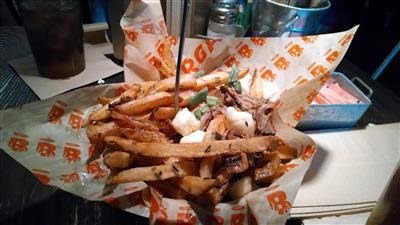 It's fries topped with braised short ribs, cheddar cheese curds, and pan gravy. Oh my gosh these were really tasty. The shorts ribs were so moist and flavorful. Definitely an order again dish - but that means no milkshake because I am super stuffed. Good thing it was a cold day so I didn't really want a milkshake. 2. 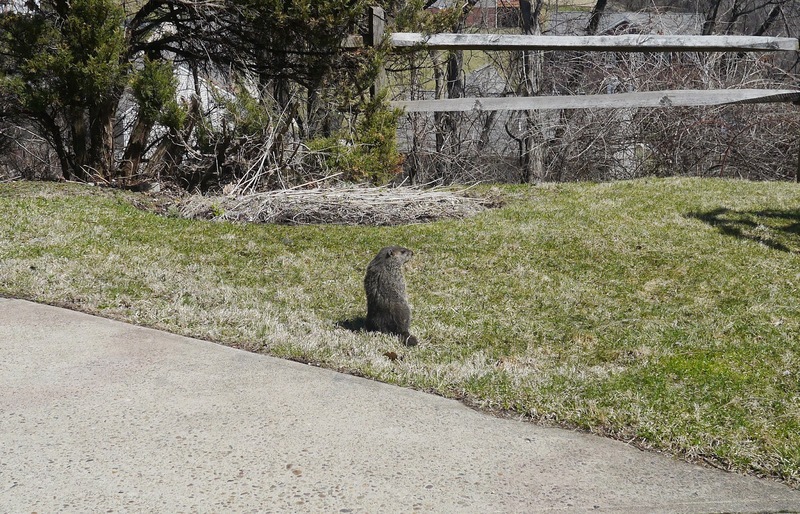 Otis the Groundhog is back. He showed up this past Sunday. Hanging out in our backyard, wondering where the grass clippings and daylilies are. I've got news for you Mr. Groundhog - the calendar might say spring but the weather says otherwise and nothing is yet growing/blooming in our yard. Brown and bare, that's what it looks like. I felt sort of sorry for him - he looked so sad that the usual tasty treats were not available for munching. He also looked skinny. Usually he's so fat he waddles. 3. OK. The weather finally might be saying spring this week. It's supposed to be 70 degrees today. But this past Saturday, April 5 was freezing cold and windy and I was miserably cold even though I was wearing a turtleneck sweater, scarf, winter coat, earmuffs, and gloves. 4. Last Sunday, in addition to the Chocolate Hazelnut Pizzelles, we made some regular vanilla-anise pizzelles. I think we made way too many pizzelles for 2 people! I'll probably give some to my friend tomorrow when she visits. Her kids like them. Good thing pizzelles keep for a while. 5. My parents are coming for a visit over Easter. I haven't seen them since the end of August, so it's been almost 8 months. They arrive next Wednesday so we're busy trying to plan dinners and activities. And by activities I mean mom & I going shopping at the malls and me making a list of some house chores/projects for dad to think about possibly doing while he relaxes on the couch in the sunroom. 6. Speaking of the sunroom, we were in there for about 10 minutes last night. Despite the sunshine and the warmer temps, that room is still quite chilly (it's not on the main heating system though it does have it's own electric baseboard heat). I'm anxious to be able to spend some afternoons in there, reading or doing cross-stitch. But it still has a way to go to warm up. 7. We're trying to figure out what to grill this Sunday. It's going to be warm and sunny and we really should inspect/use the grill before we try to use it when my parents are here. You know, make sure there's actually gas in the tank. Make sure no critters have made little homes. Clean off the grates. 8. Have a great finally like spring weekend!